No cows were hurt in the making of these bean bag chairs. Our little chalet apartment needed a little more seating for our visitors to be comfortable, particularly when there are children. 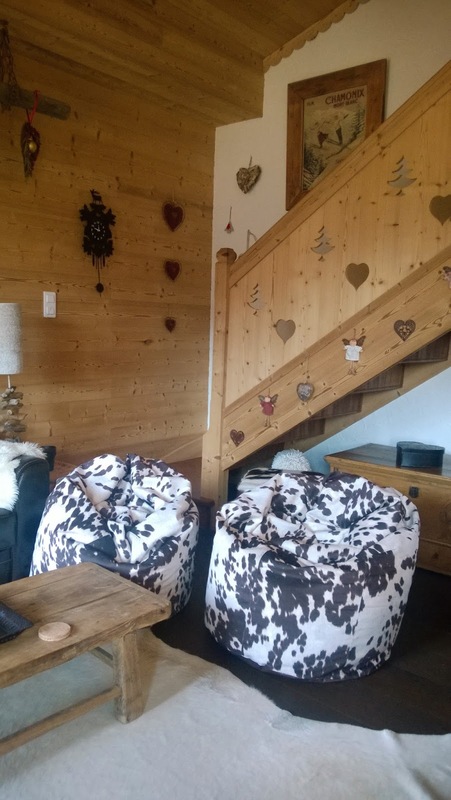 I thought bean bags would be a great idea and my husband agreed but added that they should be out of cow skin, in keeping with the French/Swiss alpine theme. I think he really meant cow skin too, but I knew that would be too stiff for bean bag chairs and very expensive too. I found a much better alternative - a fabric called "Udder Madness." It's upholstery weight but soft, washable (by hand), and worked perfectly for these bags. That's a lot of bean bag fill! I bought the bean bag fill from Amazon Germany because I figured local delivery would fare better than having it sent to my APO, plus package delivery to APO in November-December is bogged down due to Christmas. But I know that Amazon in the US sells fill also, just from a different supplier. 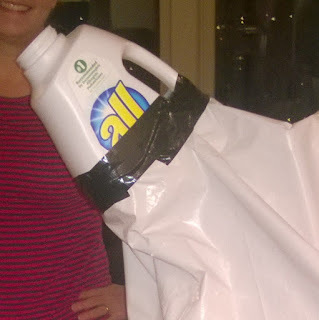 We turned an empty laundry container into a funnel. Filling the bags is definitely a 2-person job. Even with our "funnel", we still managed to spill some pellets...well a bunch of pellets. And getting the last bit out of the bag was even more fun. It's impossible to get all of the pellets out due to static electricity but we tried. I mention it in my review below, but in case you don't read that far, I used 430 liters to fill both bags, so about 215 liters in each. The bags were a hit! The kids lounged on them to watch XBox during the day and the adults lounged in them at night to watch movies. If I made them again, I would probably skip making bottom piece out of vinyl because in use the bags seldom ended up with the circular bottom on the floor. The kids often squooshed the bags into a teardrop shape with the side of the bag on the floor and the bottom of the bag perpendicular to the floor, so having the vinyl didn't serve any purpose. I made two of the small size. I sewed it up without really needing to read the instructions but I did use the pictures to see that I should top stitch the outer cover. 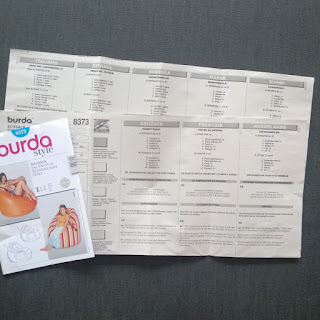 I bought my pattern in Germany and despite there being English on the outer envelope and on the pattern pieces, the instructions were in German and seven other languages but not English! Using the pattern, you cut 6 identical side pieces, a large bottom circle and a top circle as well as a rectangular pattern piece for a handle and a pattern piece for a pocket. The pattern includes 1 cm (3/8 in) seam allowances, which is fine for the muslin or lighter weight fabric lining, but if your outer fabric frays or is very thick you might want to make slightly larger seam allowances. The 1 cm is ok for the seams but was pretty tight for putting in the zipper. You actually make two of everything - one is the lining to contain the bean bag filler and one is the outer cover. 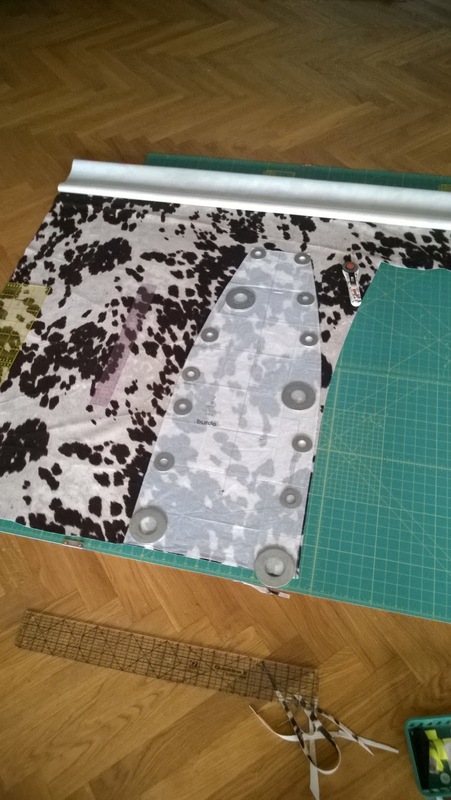 I sewed the lining first, which I recommend so that you get a good idea of how everything goes together before you deal with your potentially bulkier outer cover fabric. For the lining, which was out of muslin, I used my serger for construction so the seam allowances would be contained. The pattern instructions say to leave an opening in the lining for the bean bag filler and then stitch it closed after filling it, but I chose to put in a zipper, so for that seam I used the regular sewing machine. For the outer fabric I used my regular sewing machine so that I could top stitch. I sewed the side pieces together in pairs first and put the zipper in on one of the pairs. This made it easier to put the zipper in and also to do the top stitching on either side of the seam on the outer cover. For the circles, I used a quilting ruler with 60 degree lines on it to mark the circles evenly into 6 pieces so that I could stitch them on evenly. I omitted the pocket, but did sew on the handle. After attaching the handle, I worried that it would rip the outer fabric at the stitching line, so I reinforced that area by stitching with a zig-zag to a bit of extra fabric on the inside. I think that will help better distribute the stress in those areas. Finally, a note about filler. The pattern doesn't give you any help in determining how much filler to use. It's generally sold by the liter. 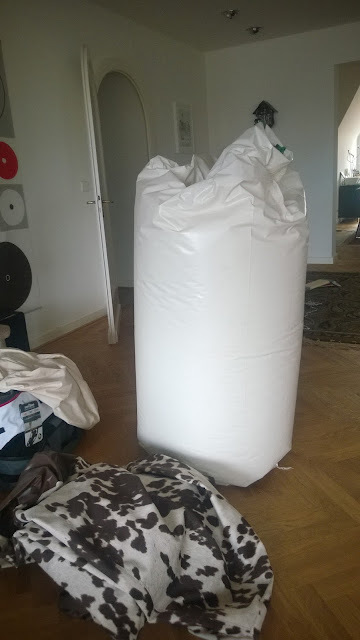 I bought 430 liters of filler from which to fill both bags (from a source in Germany through amazon.de). I was worried it wouldn't be enough but it turned out to be maybe a little too much, which is ok because over time the little pellets get squashed. You could make your own pattern for a bean bag, but I liked the proportions of this bag and by using this purchased pattern I didn't have to think too much or worry about my calculations being off. Some bean bags, including purchased ones, don't have a separate lining bag but I liked that this pattern suggests that you make a one. The inner lining is muslin, purchased from IKEA. The outer cover is a fabulous upholstery weight fabric called "Udder Madness" - it feels and looks like cow hide but is 100% polyester and can be hand washed. It was very easy to work with and took stitches well. I used a size 100 denim needle, stitch length of 3 for seams and 3.5 for top stitching. The fabric didn't fray and is soft and pliable enough for use as a bean bag, a feature which also made it easy to manipulate while sewing. I used vinyl for the bottom round piece to make it more durable and also because I thought the nap of the cow print might interfere with moving the bean bag around. I omitted the pocket from the outer cover and added a zipper to the inner lining. I've already had a (non-sewing) friend ask if I'd make more. The danger of being able to sew. Considering that each large bean bag takes 5 1/2 yards of fabric (for each bag, so 11 including the lining) and the small takes 3 1/4 yards for each bag, depending on the choice of outer fabrics, these could be pricey bags. But it's a great way to make some statement bean bag chairs! Easy pattern and the resulting bean bag has a nice sit-able shape to it. Although I intended to make these bean bags for children, the small size, with enough filling, is still suitable for an adult to sit in.